CasinoSmash is Now on YouTube! We are excited to announce that CasinoSmash has just launched its official YouTube channel! If you’re looking for a way to get a taste of the latest games and casino bonuses before making any commitments, you can now watch me play on CasinoSmash’s new YouTube channel! Our channel is dedicated to giving our readers a first impression of some of the most popular casino games on the web, where I will be playing for a fixed time in the hopes of winning big – and I sometimes do! 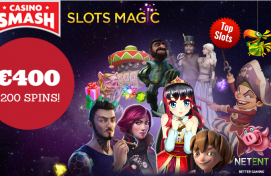 Through our channel you will not only get a look at the game play of the most popular casino games, but you will also get exclusive bonus offers from free spins to massive deposit match bonuses at our top rated online casinos. To claim these exclusive offers, make sure to watch our videos and check out the description box underneath. In the video description, you will find a link to a unique bonus deal depending on what casino I’ll be playing in. And there’s more coming soon! We will also be live streaming some slot sessions in the very near future, so make sure you subscribe now to get the latest video updates right when they happen! If you have any suggestions or ideas for games you want us to cover, you can go ahead and send me an email at [email protected]. Free Spins and Cash: This Triple Welcome Bonus Has It All!